A scenic view from the Lindsey Creek bench cut portion of the Historic Highway Trail. Since 1987, the Oregon Department of Transportation (ODOT) has been charged with working with Oregon Parks and Recreation Department, the State Historic Preservation Office and Travel Oregon to preserve, enhance and reconnect the Historic Columbia River Highway. The Historic Columbia River Highway is in the state of Oregon, along the south side of the Columbia River between the cities of Troutdale (14.2 mi. east of Portland) and The Dalles (88 mi. east of Portland). The Historic Columbia River Highway was the first modern highway constructed in the Pacific Northwest and the first scenic highway in the United States. It was listed in the National Register of Historic Places in 1983 and became a National Historic Landmark in 2000. The road is the pinnacle of early-20th-century rural highway design created to take visitors to the Columbia River Gorge's natural wonders and scenic vistas. The Historic Highway was a portion of the longer “Columbia River Highway,” and was constructed between 1913 and 1922. Portions of the Historic Highway between Dodson and Hood River were sacrificed in the 1950s, 1960s, and 1970s for construction of the water-level route that became Interstate 84. Those discontinuous segments that remain between Dodson and Hood River; however, possess much of their original integrity, including masonry walls, bridges, viaducts and pavement. ODOT is restoring several of these segments for non-motorized use. 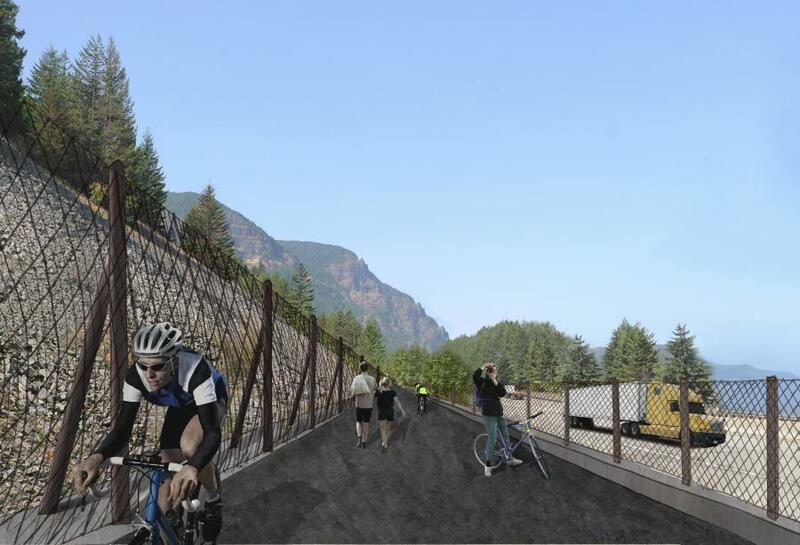 Once the Historic Columbia River Highway State Trail is complete, previously severed stretches of old highway will be transformed into a cycling and pedestrian destination. Many of the state's 90 waterfalls can be seen from the State Trail. No longer will cyclists need to travel on Interstate 84 from Troutdale to Hood River. 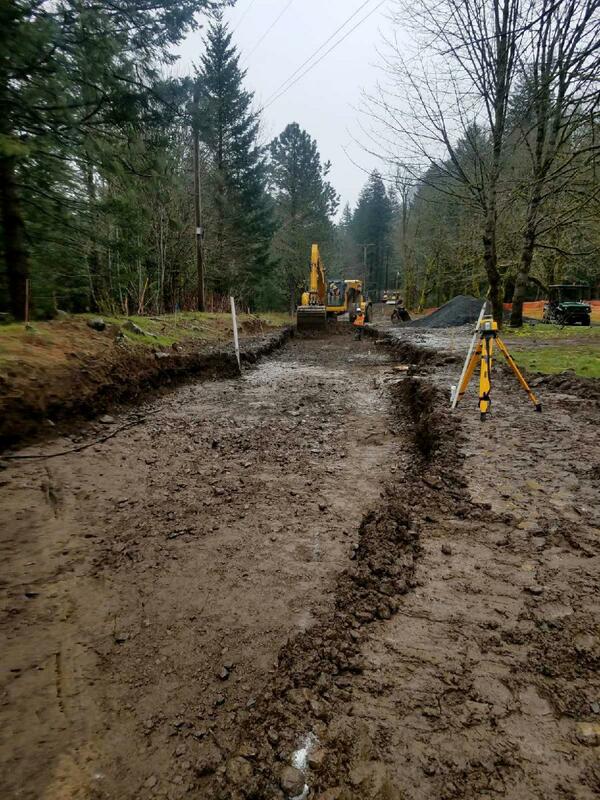 In spring 2017, a State Trail Reconnection Project began to construct a segment of trail between Gorton Creek Trailhead at Wyeth (I-84 near milepost 51) and Lindsey Creek. This major undertaking includes a trail around Shellrock Mountain on top of the existing bin wall, a 500-ft. Summit Creek Viaduct (bridge over land), and the Lindsey Creek Bench Cut. The newly constructed trail will be open in fall 2019. The three miles currently under construction are divided into four project points. First is the new viaduct at Summit Creek, which will connect the abandoned highway sections and blend with the Gorge's natural landscape. The design detailing will draw upon the iconic structures found along the Historic Highway. Next up is the Mossy Road section: This scenic section of the old highway will be reconnected and restored as a trail. The third area involves rock blasting for the Lindsey Creek bench cut to create space for the State Trail. The rock cuts and a new stone wall will help the trail blend in with the surrounding landscape. Lastly is Shellrock Mountain Crossing, which requires sophisticated engineering to hold back Shellrock Mountain and squeeze in a trail behind the existing wall protecting Interstate 84. 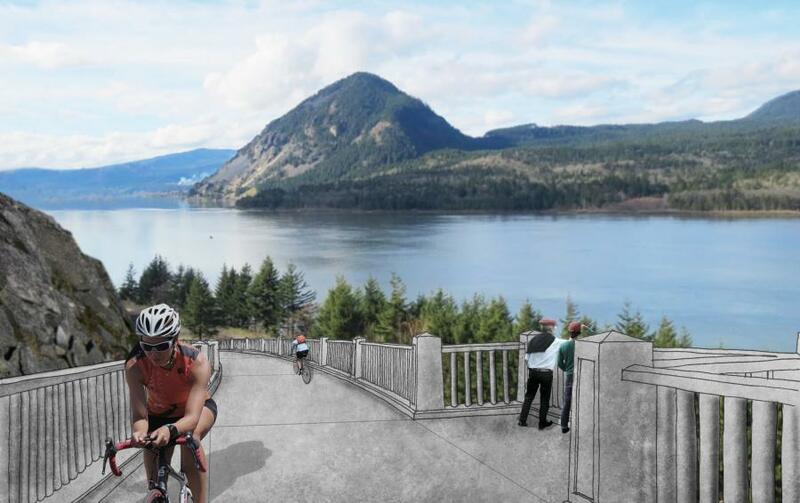 The Wyeth to Lindsey Creek segment of the Historic Columbia River Highway State Trail will provide users with a car-free trail to experience stunning views of the Columbia Gorge. The State Trail remains true to the Historic Highway: The State Trail follows the original alignment of the Historic Highway when possible and the structures and features mimic the original design and aesthetic. The Historic Highway brought people to many beautiful spots in the Gorge. Each State Trail segment reconnects the public to forgotten treasures and allows users to experience the Historic Highway journey anew. Improvements to the trailhead at Wyeth include a bike fit-it station, a water refill station, a restroom, and a pollinator habitat for butterflies, birds and bees. The $18.8 million project received a third of its funding through the Federal Lands Access Program, which is a competitive funding program for projects improving access to public lands. Another third of the funding came from the Oregon Transportation Commission (OTC) Discretionary Fund. The Historic Columbia River Highway State Trail project is 30 years in the making, at the direction of the Oregon State Legislature and is considered a high-priority project for the state. One quarter of the funds were procured through competitive state funding programs (STIP Enhance and Transportation Alternatives Program). Both funding sources were for enhancing and expanding the transportation system, with a focus on bicycle and pedestrian facilities. Partner donations, state funds approved by the OTC and the Public Lands Highway Discretionary Program contributed the remainder of the budget. 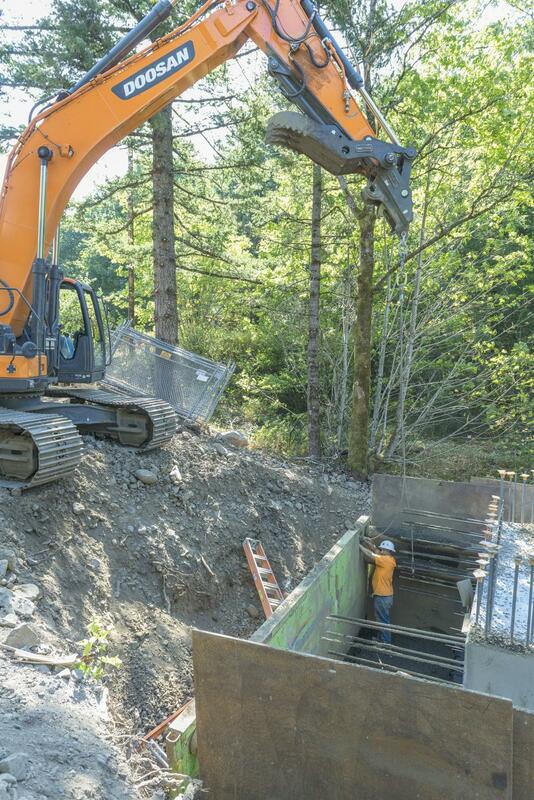 Stellar J Construction, based in Woodland, Wash., is the prime contractor responsible for excavation work and constructing the viaduct. 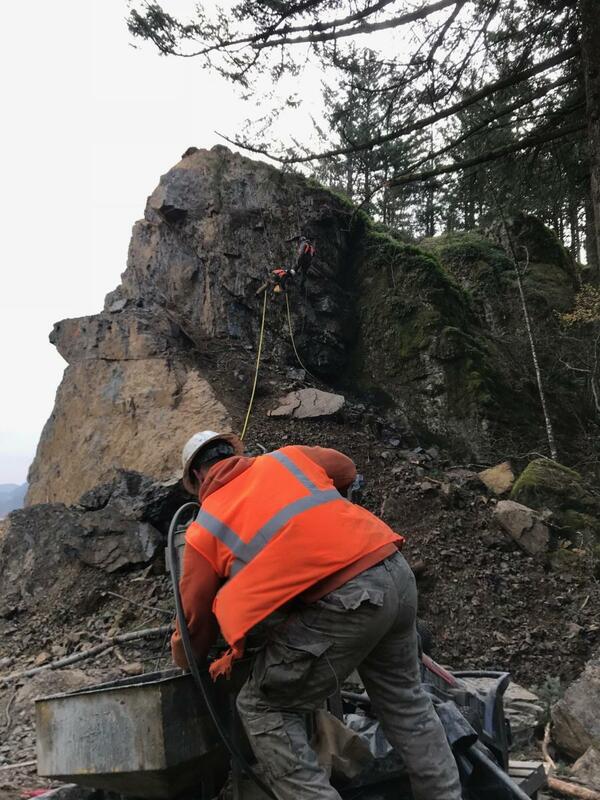 Rock blasting is being done by McCallum Rock Drilling, Salem, Ore., division. Kodiak Pacific Construction of Sherwood, Ore., will pave the ADA accessible grade trail. Western Federal Lands Highway Administration is the contract administrator. Approximately 50,000 cu. yds. of earth will be excavated in total. Crews have brought in slope rock drills for rock bolting and dowels, attenuator post installation and wall tie backs. They're also using a 318 Caterpillar excavator with a mounted drill rig. Travelers can expect a single lane closure of eastbound I-84 from milepost 51 to 53 (from Wyeth to Lindsey Creek) to be in place until mid-May 2018, and periodic shoulder closures. These closures are necessary to facilitate construction of viaduct and work at Shellrock for bin walls. A few months into construction, crews were confronted with the outbreak of wildfire at Eagle Creek. The destructive flames tore through the Columbia River Gorge on Sept. 2, 2017 and continued burning through the end of November. Highway closures and evacuations went into effect as the inferno consumed 48,831 acres of land. The fire did, however, cause a temporary closure to another segment of the State Trail from Bridal Veil to Hood River. To date, 65 of the original 73 miles of the Historic Columbia River Highway are now open to travel either by motor vehicle (Historic Highway or connecting county roads) or by foot and bicycle (State Trail). After the completion of the current 3-mi. project, only 5 mi. at Mitchell Point will be needed to complete the connection. Mitchell Point is a formidable mountain that requires a new bridge and/or tunnel to connect the western segments of State Trail to Hood River and The Dalles. This segment has received funds to design a crossing and efforts are beginning now.